The following top sponsors are top sponsors who have chosen our banner ads promotional service. They are dedicated to creating jobs for Americans and to producing top quality products made in the USA. Since it isn’t always possible to showcase banners on mobile web sites, we chose to use this page to ensure they are highlighted. We hope you will take the time to shop with our top sponsors and share them with everyone you know. All USA Clothing – All USA clothing offers quality clothing for the entire family. Men, women, children’s clothing and more. From everyday wear to work wear and more. They offer great screen printing services and offer wholesale as well. Authenticity50 Luxe Bedding – Ever want to go to bed at night and feel as though you were sleeping in the bed of a very nice hotel? Well these sheets and the epitome of luxury sleep at a great price. They go above and beyond to ensure these sheets are not only extremely comfortable but they also make sure they are 100% made in USA. Dutchcarfters Amish Furniture – When you want fine heirloom quality furniture, you want DutchCrafters Amish made furniture. Their furniture is not only made to last it is made to pass down to other generations. They make a variety of styles for any room of the house inside and out. Not to mention garden products and more. Visit their web site to see all they have to offer. Goodwear Clothing – Goodwear offers great clothing for men and women and are proud to make their clothing in the USA. They work hard to ensure each piece is made right. They pay their employees livable wages and are staunch supporters of Buy American. 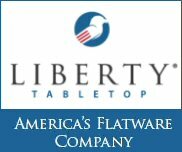 Liberty Tabletop Flatware – The only flatware company made in USA and they are proud of their humble beginnings. They struggled far beyond what many new companies do,m but through sacrifice, hard work and determination, they took an old Oneida plant and created Sherrill manufacturing producing high quality flatware that rivals any imports and priced competitively by cutting out the middle man. 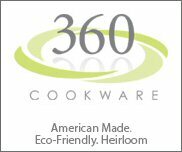 They do offer an easy option for boutique retailers to sell their products too.Their flatware sets make great wedding gifts. Men’s Suit Separates – When you want to look good but don’t want to spend a fortune, then visit Men’s Suit Separates. They bring you quality suit separates made in USA. They take pride in showcasing high quality clothing at affordable prices all Made in America. 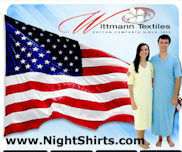 Wittmann Textiles – This family owned business for over 60 years has been creating sleepwear for men and women. Their nightshirts have a retro look and consumers who purchase them love how comfortable they are. 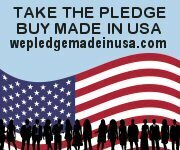 If you love Made in USA, check out all they have to offer.